How do I earn residuals? If you sign up your customers for QB payments, assisted or stand alone full service payroll, you will earn an ongoing residual. The residuals take about 60 days to start after the accounts are activated and the client starts using their account. The residuals are shared 50% with the partner and paid monthly on the 16th of each month for the month prior. Do I earn residuals if I am not an active partner? No. Partners may only earn residuals if they are in active partner status. After 12 months with no sales or activity in the program the partnership agreement is cancelled and the partner no longer earns residuals. If you are cancelled then you may reapply. Partners are paid 50% on all commissional sales. Products sold at cost will not be commissionable as the client received a higher discount rather than making commission. Commission payments to partners are paid each month on the 16th for all sales the month prior. How does compensation work for new QBO signups? We give your customer a 30 day trial and after that we are paid commission (not immediately but next round of payments). All commissions with CBG Partners are 50% share. How do we refer work that is outside our wheelhouse? We have built a network of experts and can assist you in connecting with a partner that is specialized the area you are looking for support. If you come across a client that is beyond your scope you can email us to let us know what you need help with and we will get going to help you find the support. I am a CPA and can't earn commission, can I join? Yes, of course you can join. You are getting your customers the very best pricing with their best interest in mind. Click here for price sheet. Our QBO and QBES discounted pricing is perpetual. Our Merchant service fees/rates are lower than direct. 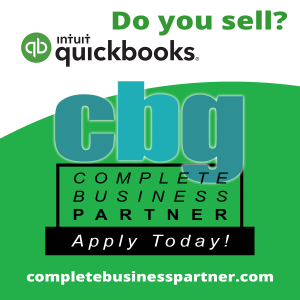 Can I learn under CBG and later become a QuickBooks Service Provider (QSP)? You certainly can, just keep in mind that your book of sales does not transfer. CBG remains the reseller of record. It’s an opportunity for you to see if you are capable of earning the sales quota required. However, when you sign up as an QSP you start all over. You can submit an order by using our order form. Select the form for the product you would like to order, then complete the form and submit online. We get an instant notification and will begin processing the order right away. What are the QSP discounted rates available through the Partnership that I can offer my clients? QSPs and partners of CBG can offer their clients discounted rates. You can click here to see the pricing list. If a client wants to add QuickBooks Payments on their account, how do I set this up? 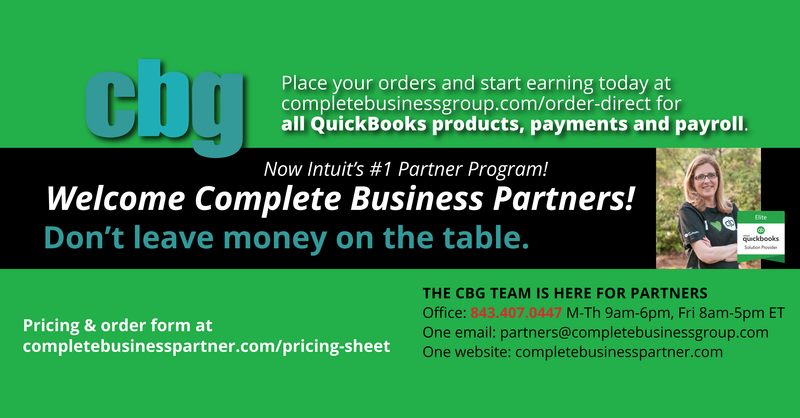 You will need to complete the payments lead form to submit to the Intuit Payments team for approval. Click Here to Apply. Will participating in CBG Partnership affect my ProAdvisor account? This doesn’t affect your ProAdvisor account, I am also a ProAdvisor. Our partner program enhances what you already have as a ProAdvisor. If you have a wholesale QBO billing account, you can continue to use that method, or you can sign up your customer for QBO under us and secure discounted pricing. We have access to best pricing on everything, on some of the products, we are paid commissions which we can share commissions with you that you cannot earn as a ProAdvisor. How do I request a partner landing page? By requesting your own page, it makes it easier for us to track your sales so you get credit when this unique URL is used to place orders. Click here to request your landing page. As a pro-advisor you get really good support. Always use that first. Also, our QSP top tier Support lines listed above are great as well. If you have a serious support issue, we ask that you exhaust all your support channels, then we can help you elevate your support requests if you have an active support request number. We can also refer you to one of our expert technicians in our network, who offer discounted rates to our partners/clients if you need support or installation that can’t be resolved with the free support options. Who does the installation of software? We can provide you with all access to the free support that is provided with the software. We do not do the installation for you. If you need support for installation, then we can provide you with an expert technician who you/your client can contract with at a discounted rate. Can CBG help me close a sale? If you need assistance getting up to speed and help closing the deal we will honor your 50/50 commission but you have to be involved in the process from start to finish as we are assisting to help you learn and get comfortable closing the sale. We will continue to strive to add value to our partners and assist you in closing sales as needed. What if I just want to pass a client over to CBG? If you don’t want to be involved in the quote, order, closing process and prefer to simply refer the deal to us so you can avoid the hassle of closing the deal with your client, we offer a $20 referral fee in lieu of commission if it closes. We prefer that you are involved and make 50% commission because you know your client better than anyone and we have much better success with our partners helping during the sales process. Who is the Seller of Record? CBG is the seller of record, not the partner. This is in our partner contract. If you ever were to become a reseller yourself, the sales you have under us would not transfer. Does the Seller of Record affect my client? No. As a partner of a QuickBooks Service Provider you are able to offer your client the lowest prices available. Are there any drawbacks to CBG being the Seller of Record? No. If you process your order through Intuit direct the prices are higher for you client and you do not earn commission (if applicable). You also do not get sales credit. Is TSHEETS considered a "Quickbooks Product" under this agreement? Not yet, but this is changing as we speak. I would suggest using your existing TSheets Pro account if you have one and keep asking in the future as this may change. QuickBooks Pro & Premier are sold at cost, is there any commission opportunity? Only for QB Pro/Premier PLUS. It is a subscription with a one time commission. QB Pro/Premier Desktop is sold at cost. Can an existing QB Payments account run through my ProAdvisor account be transferred to CBG? We cannot transfer existing accounts. However, we can set up a new QB Payments account for your client and you can begin earning residuals. Can new clients with QBO have their existing subscriptions transferred to this contract? We cannot transfer wholesale billing accounts to CBG. If a client's payroll is up for annual renewal, can the renewal be processed under this contract? No, they are locked in whatever program they signed up for unless it’s old and grandfathered, then we can move them to a new subscription around renewal. Mostly no on payroll pricing. If I am not yet approved as a CBG Partner, can I submit an order and get credit? You do not have to wait and we will tag to you to make sure you get credit for the sale. We process our partner applications quickly so you do not have to worry about approval. When you order you need to allow 1-2 business days to get the license.